TACLOBAN CITY – Brgy. Hingatungan, Silago, Southern Leyte is the National Awardee (champion) for barangays in 4th - 6th class municipalities in the Lupong Tagamapayapa Incentive Award (LTIA). Regional Director Pedro A. Noval Jr. of the Department of the Interior and Local Government (DILG)-8 revealed that they have been notified of such development by their Central Office through a letter dated January 31, 2013. Dir. Noval credited Brgy. Hingatungan for being a consistent regional LTIA champion and having won the national award in 2003 and 2007 and figuring in the Top 3 in other times. 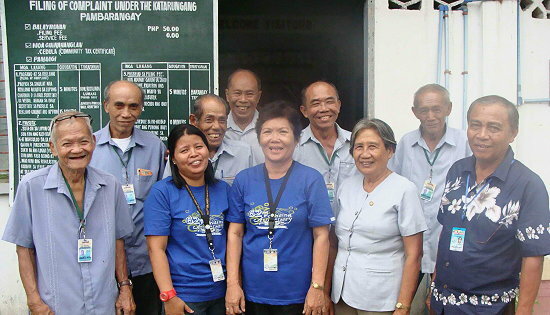 “The Hingatungan Lupong Tagapamayapa (HILUTA) is composed of senior citizens noted for their innovative and creative activities and deep sense of volunteerism, thereby giving value and significance to the Katarungang Pambarangay”, informed Dir Noval. It was further learned that DILG is just waiting for advice from Malacañang on when President Benigno S. Aquino III would be available to present the award to Brgy. Hingatungan Punong Barangay Rosalinda Lumaas and other awardees in the LTIA national recognition ceremonies. Among 4th to 6th class towns, the other regional finalists are Brgy. Nena, San Julian, Eastern Samar; Brgy. Bulalacao, Kawayan, Biliran; and Brgy. San Juan in San Isidro, Northern Samar. In the 1st to 3rd class municipalities, the Regional Champion is Brgy. Biasong in Hinunangan, Southern Leyte which won over Brgy. Calachuchi in Catarman, Northern Samar; and Brgy. Amandayehan in Basey, Samar. Brgy. 69 Rawis, Anibong, topped the evaluation of top performing Lupong Tagapamayapa in the region's only Highly Urbanized City (HUC), Tacloban City. Meanwhile, Brgy. Cogon in Ormoc City bested Brgys. Rawis in Calbayog City; Tagnipa in Maasin City and Brgy. Bato in Borongan City for the category of Independent Component/Component Cities in the region. The LTIA Regional Award Committee (RAC) is led by DILG with the participation of the judiciary, Philippine Association of State Universities and Colleges, private schools, among others. The RAC assessed the submitted documentation of regional finalists together with the results of the regional evaluation team which conducted onsite validation. Marissa Lendio, social worker of Children of Asia; Deena Perez Pages, resident agent of Children of Asia; and Charlotte Bourrat, local coordinator of Children of Asia; and Amaya Aboitiz, DACF executive director officially launch the partnership between RAFI and Children of Asia through a MOA signing last Feb. 5. 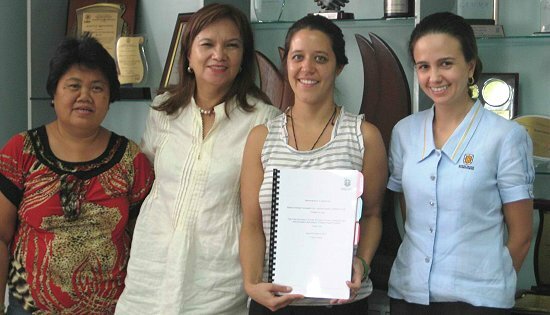 CEBU CITY – To address malnutrition among children in four day care centers in Ermita, the Dolores Aboitiz Children’s Fund (DACF) of the Ramon Aboitiz Foundation Inc. (RAFI) signed a memorandum of agreement with Children of Asia on Feb. 5. Barangay Ermita is one of the urban barangays in Cebu City that has a high incidence of poverty and malnutrition. In 2011, barangay Ermita had the highest malnutrition rate in Cebu City. Twelve percent of the children below six years old that year were found to be undernourished based on the standards used by the government. The partnership will launch a project that will benefit 200 day care pupils in Barangay Ermita through the provision of daily nutritious meals, school supplies, and uniforms. It will also provide parenting seminars for the parents of the children. Children of Asia will fund the training of day care workers, and, together with the barangay, provide additional honorarium for day care workers. This grant was part of the RAFI-DACF Development Fund call for proposals last year. DACF, in its pursuit to provide opportunities for the development and care of young children aged 0-8 years old, has launched a call for proposals for projects related to early childhood care and development (ECCD). Specific interventions must be on play and early childhood development, local culture integration, community participation in early childhood education, and developmentally appropriate practice. Interested groups can submit concept applications on or before Jan. 31(1st cycle) or July 31 (2nd cycle) every year. For application forms and guidelines, please e-mail jan.montilla@rafi.org.ph or call 418-7234 local 512 and look for Jan Montilla. DACF is under RAFI's Education focus area, believing that shaping the next generation of talents begins with nurturing the love for learning. Other focus areas of RAFI are Integrated Development, Micro-finance & Entrepreneurship, Culture & Heritage, and Leadership & Citizenship. For more information about DACF, please contact 255-5630 and look for Joem de Gracia, or visit www.rafi.org.ph or www.facebook.com/rafi.org.ph. QUEZON CITY – Rights group SELDA (Samahan ng Ex-Detainees Laban sa Detensyon at Aresto) warned Martial Law victims of possible scammers in the process of their application for compensation for human rights victims. “We call on all Martial Law victims to be wary of persons who ask for money for processing their claims,” said SELDA chairperson Marie Hilao-Enriquez. Enriquez said their organization issues this warning after receiving reports that some victims were approached by people who asked for personal information and for processing fee for their claims. Victims of human rights violations under Martial Law are entitled to a compensation after the bicameral session of the Senate and Lower Houses signed the final version of the Martial Law victims indemnification bill, now called the Human Rights Violation Victims Reparation and Recognition Act of 2013. Pres. Noynoy Aquino is said to sign the bill into law on February 25, the anniversary of EDSA People Power. According to Enriquez, a friend from the media forwarded her an e-mail from a concerned citizen who raised concern on the possibility of a scam. According to the e-mail, individuals in Marawi City, some of them teachers, were “recruited” to attend a seminar in Davao City as Martial Law victims. They were allegedly asked to give P3,000 each, and were told that they will receive a million pesos if they attend the seminar. SELDA is currently verifying the said report. “We are advising everybody not to fall prey to these culprits. We have fought for justice this long. We should ensure that the compensation, however small, shall be received by the rightful recipients,” Enriquez said. SELDA also received a report from its local chapter in Concepcion, Tarlac that two SELDA members, both teachers in an elementary school who are tasked to encode documents of claimants in their town, were approached by a certain Gerry Caloza. He told them that he is from the Office of the President, and asked all sorts of question about their documentation work. Caloza cannot give any clear reason why he was interested with the information on the victims. Martial Law victims in Bataan, meanwhile, were approached by persons identifying themselves as members of a certain Bullion group, who told them they will receive millions in claims. The victims immediately informed Selda of the report. Enriquez said it will be most safe and secure for the victims to contact SELDA, one of the organizations recognized under the Human Rights Violation Victims Reparation and Recognition Act of 2013 to identify victims and help process the claims. SELDA was the lead organization in the historic filing of the class suit against the Marcoses in 1986, and has regional chapters nationwide which may help identify victims who may receive claims. Enriquez also said their apprehensions are not baseless since there was a case on fake claimants discovered last year. In November 2011, Edward and Marlyn Santiago, along with six others, were charged with estafa after the Criminal Investigation and Detection Group (CIDG) found out attempts by some individuals to encash checks named after legitimate victims using fake IDs. The Santiago couple is suspected to be recruiting persons to claim checks under the name of legitimate claimants. For more information on the compensation for Martial Law victims, please contact SELDA at (632) 434-2837 or 0917-596-5859. PASAY CITY – Senator Chiz Escudero said he will file a resolution in the Senate to commend Menchu Sanchez, an immigrant Filipino nurse in the United States who President Barack Obama honored during his State of the Union address last Feb. 13 for her heroism at the height of Hurricane Sandy which hit the US last year. In his State of the Union Address, Obama cited Sanchez, a nurse at New York University's Langone Medical Center for assuring the safety of hospital infants in the care of the hospital during Hurricane Sandy. "We should follow the example of a New York City nurse named Menchu Sanchez. When Hurricane Sandy plunged her hospital into darkness, she wasn't thinking about how her own home was faring," Obama said in his annual address to Congress. Sanchez was among the honored guest during Obama's speech and was sitted in the viewing box with First Lady Michelle Obama. Escudero said that while overseas Filipino workers are considered the country’s modern day heroes, Sanchez is rightly the country “heroine of heroes”. TACLOBAN CITY – In preparation of its full automation by middle of this year, the Home Development Mutual Fund (Pag-IBIG Fund) is once again reminding employers and members who have not registered yet online to do so to fully implement the system. During the Suruswerte ha PIA Tuesday, Pag-IBIG-8 marketing division chief Leo Larraga said that the program will run once the nationwide online registration will be completed or complied by all the employers and members. “The ultimate objective of this full automation is for you to be able to view your records online such as loan status, payments/remittances, membership records and everything and anything about Pag-IBIG,” he said. As to compliance, Larraga observed that agencies/offices both private and public as well as individual payors in Eastern Visayas responded to their call although only four percent had not complied since they started their campaign in 2011. Larraga explained that registration online is just easy and takes only 10 to 20 minutes by logging on to www.pagibigfund.gov.ph, click e-member services facility then click online membership registration. However, he suggested that for those who have no internet access, they may do the registration in internet cafes near their area or visit Pagibig offices so they will be assisted. A member has to register “As New” since this is their first time to register online even though they were already issued a Pagibig Membership ID before, he said. Asked if a member can edit the data in the system, Larraga said that for now, the editing facility in the program is not yet available, however, he emphasized that every registrant should not commit error in three things – name, birthday and place of birth. After a successful registration, he said, a tracking number will be given but this is only a temporary number and after the matching process has been verified, a permanent Pag-IBIG Membership ID No. (PMID) will be generated by the system. Once given a PMID Number, the member may now go to Pag-IBIG office and request for a new transaction card. Pag-IBIG no longer require submission of printout of the Member Data Form (MDF) to their office, however, a copy of the Employer Data Form is required for submission as evidence that the office has already registered. Pag-IBIG is the premiere and globally-competitive provident financial institution in the country that endeavors to uplift the quality of life of members through savings. CAMP KANGLEON, Palo, Leyte – The region’s top police official had directed the Eastern Samar Police Provincial Office (ESPPO) to conduct a thorough investigation and verification on possible affiliation with the communist-terrorists or criminal gangs of the two men they have arrested to include a massive manhunt operation against another person who shoot it out with authorities in Oras town on Wednesday afternoon. Police Chief Superintendent Elmer Ragadio Soria, Regional Director of Police Regional Office 8 (PRO8) disclosed that he ordered a thorough check on the probable involvement of the arrested suspects in criminal incidents in said province to include their possible connections to the local communist movement. “The fact that they figured in a gunfight with our men is a clear indication that they are not only dangerous but could also be involved in something illegal,” Soria said. The Regional Director identified the suspects as Alfredo Nofiel y Delao, 55, and Noel Norombaba y Balaca, 58, while another suspect Erni Normbada is still the subject of manhunt operation. Soria informed that at around 12:45 Wednesday afternoon, joint elements of Eastern Samar Police Provincial Office, Oras Municipal Police Station and 14th Infantry Battalion of Philippine Army led by Police Senior Inspector Elmerson Badilla responded to a call for police assistance from a certain Edgar Montallana of Brgy. Paypayon, Oras, Eastern Samar, alleging that he was threatened by the suspects. When the team arrived in the area and while moving towards the house of Erni Norombaba, suspect fired a .38 caliber revolver to the approaching law enforcers prompting them to returned fire. The troops maneuvered towards the house but Erni jumped through the window to elude arrest but his gun accidentally fall to the ground. The team was able to arrest the elder Norombada and Nofiel and confiscated a .38 caliber “paltik” revolver loaded with 5 ammunition and one spent shell, two homemade handguns and 7 ammunitions of caliber 5.56 mm. Arrested persons were brought to Oras Municipal Police Station for proper disposition as appropriate criminal charges are now being prepared for filing in court against them while the police have launched manhunt operations against Erin Norombada. Soria further informed that the arrest of the suspects brought to 33 the number of persons nabbed by PRO8 for gun ban violation since the start of the election period last January 13, to include confiscation of 21 firearms of different calibers. TACLOBAN CITY – The Department of Environment and Natural Resources (DENR) thru the Environmental Management Bureau (EMB) encourages schools and colleges here in the region to participate in the 2013 National Search for Sustainable and Eco-Friendly Schools. EMB-8 environmental education and information chief Maribel Munsayac said that they have already started accepting entries for the nationwide contest which was dubbed as “2013 National Search for Sustainable and Eco-Friendly Schools” a direct response to Republic Act No. 9512 otherwise known as the Environmental Awareness and Education Act of 2008. Munsayac also said that the National Search for Sustainable and Eco-Friendly Schools is an initiative in support to the declaration of 2012 as the ASEAN Environment Year with the theme “Environmental Awareness thru Eco-Schools” and the United Nations Decade of Education for Sustainable Development. The nationwide search was also organized to highlight achievement of schools that are committed in implementing various environmental programs which is open to all elementary, high school and tertiary school levels, both public and private, the activity aims to encourage schools and academic institutions to become more actively involved in environmental issues at a practical and local level. “This nationwide search also aims to develop skills and understanding among students, faculty and school administrators to initiate active responses and increase community awareness and involvement on environmental concerns,” Munsayac said. She added that the eco-friendly schools program was launched last 2009 and 2011 in which they have generated positive responses from the schools and this paved the way for the next wave of the competition in 2013. “We intended to have the awarding of the search next year instead of this year to allow schools more time to prepare and to enhance their existing eco-friendly programs. We are hoping to encourage more schools to participate and take part in heightening environmental awareness among our youth,” Munsayac said. Munsayac emphasized that the national search is a joint activity of the DENR through the EMB, the Department of Education (DepEd), Commission on Higher Education (CHED), in cooperation with the Smart Communications, Nestle Philippines, One Meralco Foundation, Petron Foundation and Unilever Philippines. With this, participating schools must submit entries in three hard copies to respective DepEd Division Offices for elementary and high school categories, and to EMB regional offices for the higher education category. The minimum requirement for judging will be the hard copies. Likewise, entries can be submitted online in JPEG format with a resolution of 300 dots per inch (dpi), a minimum size of 1536 x 2048 pixels, and a maximum file size of 1MB. Entries should be emailed to ecofriendlyschools@gmail.com. The top entry per category for every region will be forwarded to the EMB central office for national judging. For elementary and high school categories, entries should be submitted directly to their respective DepEd division offices. On the other hand, for the college category, entries should be submitted to the nearest EMB Regional Office. The deadline for the submission of entries is on March 15, 2013. Entries should revolve around the theme “Sustainable and Eco-friendly Initiatives of the Respective Schools.” Participating schools should include a brief description of the project. Entries will be rated according to the following: environment-related aspects of the school’s policy (20 pts); environment-friendly school operations and presence of environmental programs (30 pts); environment-related features of the school curriculum (30 pts); presence of vibrant eco organizations in campus (10 pts); and presence of partners and linkages in environment programs/projects (10 pts). Only one entry per school will be accepted. For the national level, prizes include, college, high school and elementary: P50,000 - 1st prize; P40,000 - 2nd prize; P30,000 - 3rd prize and plaques of recognition. For the regional level, a certificate of recognition and a prize of P20,000 will be given to regional winners for each category. All winning entries for each of the three categories, together with selected entries, will be displayed during the national awarding ceremonies in November 2013, coinciding with the National Environmental Awareness Month celebration. Aside from the national prizes, there is also a special category entitled “Nestle Water Leadership Award” aimed at recognizing and promoting the water management solutions and practices of schools. Another special category is a “Meralco Energy Leadership Award” which will recognize schools that promotes practices and initiatives in electrical safety, energy efficiency and conservation. A prize of P20,000 will be given to each of the winners at the national level for college, high school and elementary school categories. A prize of P10,000 and certificate of recognition will be awarded to each of the regional winners of all categories. For further details, please contact the National Program Secretariat, Environmental Education and Information Division of the Environmental Management Bureau-DENR at telefax numbers: (02) 9284674 / (02) 3765610; E-mail ecofriendlyschools@gmail.com; Website: www.emb.gov.ph and www.sustainableschools.ph.